Climbing a via ferrata in the Dolomites with the local mountain guide is a unique experience! You will discover the authentic spirit and traditions of the Dolomites via ferrata with “hut to hut treks” well organised only as the local people can do. This is the first reason to choose the local mountain guide for your via ferrata trekking in the Dolomites. The via ferrata in the Dolomites are protected climbing paths, a perfect opportunity for all hikers for live a unique experience in the big walls of the Dolomite mountains. Don’t worry, the via ferrata are pure fun and free adrenaline for a unforgettable holiday in the Dolomite mountains. Every trekker can climb a via ferrata in the Dolomites, from 8 year old (ergonomic reason) to 80 years old (in good health shape). The history of the via ferrata in the Dolomites began during the first world war, today we have about 600 via ferratas in the Dolomite territory and it surroundings. “Via Ferrata” in the Dolomites dialet means: “iron road” because a via ferrata is a climbing protected path, with iron cables and iron steps or ladders, along the natural conformations of the Dolomites walls. The shorter via ferrata is only 150 meters of vertical gain, the longer is 1200 meters or more. In the Dolomites you find from easy and short to longer and difficult via ferrata, one solution for every person! Take 15 minutes of your time to read these pages because this web-page is a authentic instructional handbook of the Dolomites via ferrata, informations about the technic of climbing a via ferrata, how organise your via ferrata tour hut to hut or your via ferrata holiday, all it’s here with finalised and thematical informations. 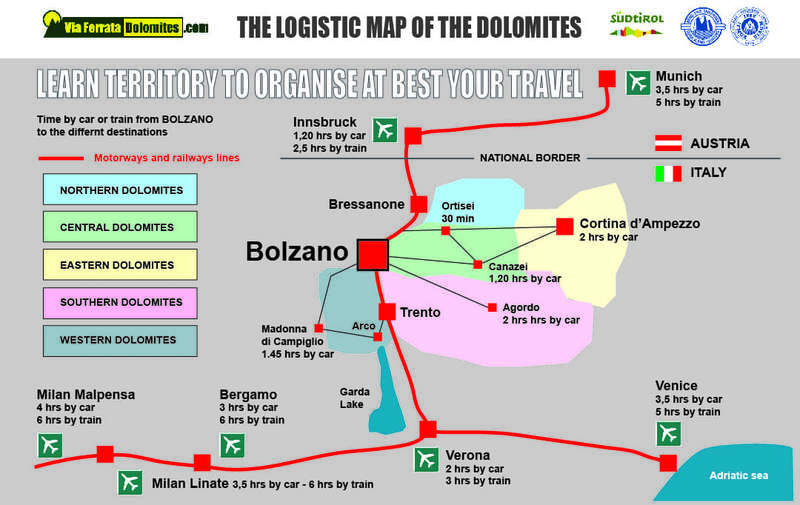 This web page is a concentrate of more of 30 years of my experience as Dolomites mountain guide. The front line in the Dolomites was began on the Pasubio mountains, in the southern Dolomites. For strategic reasons and for a particular geographical conformation, the Pasubio mountains was the theatre of the most cruent combat field of the First World War.